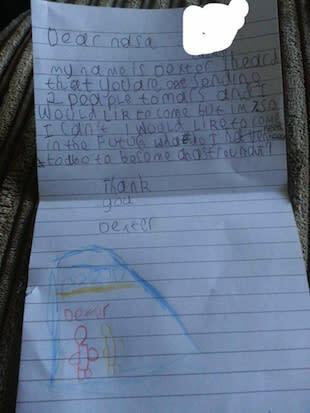 NASA has said it would like to send an astronaut to Mars some day soon, and 7-year-old Dexter Walters has volunteered. In a letter to NASA, the young British boy wrote, "I heard that you are sending two people to Mars and I would like to come, but I'm 7, so I can't," Dexter's letter read. "I would like to come in the future. What do I need to do to become an astronaut?" And really, what 7-year-old boy doesn’t want to be an astronaut? The great part about this story is that NASA actually responded to his letter. 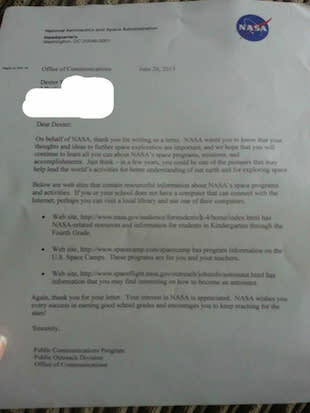 "NASA wants you to know that your thoughts and ideas to further space exploration are important, and we hope that you will continue to learn all you can about NASA's space programs, missions, and accomplishments," reads the letter Walters received from NASA's Public Communication Program. "Just think – in a few years, you could be one of the pioneers that may help lead the world's activities for better understanding of our earth and for exploring space." The letter also shows how far NASA's public relations have come in recent years. For example, another NASA letter is making the rounds today but for very different reasons. As our colleagues over at Shine reported today, an aspiring female astronaut received a letter in 1962 informing her that the space agency, "no existing program concerning women astronauts nor do we contemplate any such plan.” Of course, female astronauts have since become integrated into NASA but it helps illustrate how far things have come over the past 50 years not just in terms of where people can travel but in who is allowed to take part in the journey. Of course, it might not all blow over so quickly. After all, the letter has already received more than 2,000 comments from enthusiastic readers. In the meantime, NASA is encouraging Walters to stay focused on his schoolwork before he makes any concrete plans to fly away to the Red Planet. “NASA wishes you every success in earning good grades and encourages you to keep reaching for the stars!” the letter concludes.